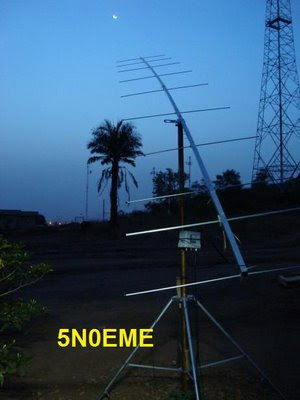 SV8CS : 5N0EME - Nigeria 2m EME New One. Bodo, DL3OCH - 5N0EME he will be working in Abuja, Nigeria for several months.He has equipments for 2m,70cm and 23cm EME activity. In 2m he is using 12 elements beam, with the IC-706 and about 1kw. I worked Bodo on 2m EME as a new one at 28/03/2009. He has a very nice signal in 2m. Here is a foto from Bodo's antenna for 2m, taken from the MMMon Vhf web page. Bodo, you are doing a very nice Job on 2m, 70cm and 23cm. Thank you for the EME qso and 1st SV to 5N 2m contact.